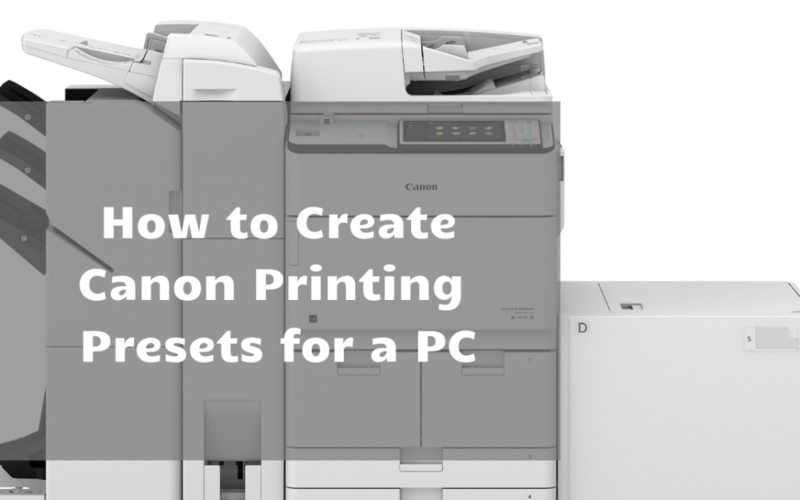 How to Create Canon Printing Presets on a PC | Duplicating Systems Inc.
Summary: This blog post covers how to create Canon printing presets on a PC. The first thing you will need to do is go to your printer’s properties, and select “Department ID Management” under “User Management”. The next step is creating the presets which you can do by going to “Preferences” in the “Print using system dialogue” menu. You can create various presets such as B/W, single sided, etc. Click “Ok” on the remaining menu boxes, but make sure to click “Apply” and “Ok” on the “Device Settings” menu. There are many ways to create presets on your Windows device, you can use a desktop app or a web browser. In this example, we will be using Google Chrome. You cannot set your Dept. ID’s within your preset menu, they operate in a different kind of menu. You may see your settings at first with the “Confirm Department ID/Pin When Printing” box greyed out. This is not recommended because you will have to confirm your ID every time you have to print, and this may become tedious. To turn this off, select “Allow Pin Settings”, and uncheck the box. Your Dept. ID will only be verified if it has been created on your printer first. If you make any changes to these presets, and then print it, will use those changes. But it will reset back to the defaults of that preset. If you have multiple print jobs that you do at your work, it is recommended that you create multiple presets so you can quickly select them when you wish. These presets are available anywhere on your computer now, on any desktop app or web browser. *If you have any questions, write us a comment down below, or call us at 706-546-1220.